Lake Garda Newsletter , Issue #001 -- August 2007 - Find out what's going on! Welcome to the August Issue Newsletter! Included in this issue are all the major events going on at Lake Garda this month, as well as an update on the latest additions to our web site. 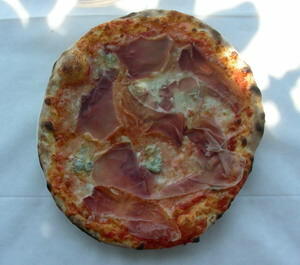 In "This Month's Topic", you're also going to find out all about one of our favourite foods at Lake Garda...Pizza! There are always lots of events going on around the lake, especially during the summer months. Are you going to Lake Garda this month? Check out these great events for August, and make sure you get to them all! 4-5 August: Garda, 7-8 August: Malcesine, 10-11 August: Limone sul Garda, 13-14 August: Bardolino, 17-18 August: Cavaion Veronese, 22-23 August: Desenzano del Garda, 5th September: The Final at Toscolano Maderno. Starting in June, this goes through until mid August. "Bisse", which are venetian-style, long and thin boats, compete in this traditional race for the "Flag of the Lake" prize. This is a colourful and exciting event, with four people on each boat standing up (like gondoliers) rowing alternately. At 3pm there is a photos and paintings exhibition. At 7pm there is a parade, followed by the start of the race. This is a festival that goes on all summer at Gardone Riviera, at the Vittoriale Theater (an outdoors arena). There are different things on everyday, including operas, dancing, music shows and exhibitions. Well worth going to! During August, the festival is on: the 2nd, 3rd, 5th, 6th, 8th, 10th, 12th, 13th, 16th and 18th. This is an international music festival going on throughout August at Manerba del Garda. A fireworks display taking place on 12 August at Desenzano del Garda. This is a medieval event that includes dance and folklore. It takes place between 4-12 August at Canale di Tenno. A fun fairy-tale fête and fireworks display at Riva del Garda. This takes places between the 24th and 28th of August. This Month's Topic: Italian Pizza!! I say "Italian Pizza" because it's completely different to pizza found anywhere else...it's so much better, in our opinions! Pizza has a fasinating history. Did you know that it's been around since about 1000 A.D.? Back then, it was only eaten by the poor, originally made from lard cheese and herbs and cooked over red-hot stones. The tomato based pizza, that we know today, didn't come along until around 1850, well after the introduction of tomatoes into Italy by the Spanish. The most popular and well-known pizza is the "Pizza Margherita". Wonder how that originated? Well in 1889, King Umberto I and Queen Margherita, who were staying in Capodimonte, asked to try this dish called "pizza" that they had heard about. So don Raffaele Esposito, the most famous pizzaiolo of Naples, prepared 3 pizzas for them. He made two traditional ones and a third, special one in their honor. He wanted to show the colours of the Italian flag, so he put tomatoes, mozzarella and basil on it. Queen Margherita loved it so much that he then launched it in his pizzeria, and called it, of course, "Pizza Margherita"! Whenever we're at Lake Garda, we often have a pizza every day! What gives it such flavour is the fact that they still cook them in a wood burning brick oven, just the same as hundreds of years ago. It's fasinating to watch the pizzaiolo preparing and cooking your pizza, it really is a spectacle in itself! Indeed, we think that a Lake Garda holiday isn't really complete without experiencing the wonderful pizzas. Make sure you try them when you go! And don't forget to take our menu translator (found in the Food & Drink section) with you so you can try out lots of other amazing dishes, knowing what everything is. We want to hear about your Lake Garda experiences and stories. Get your story in a future newsletter and share your experiences with others! Please e-mail us your stories, we'd love to hear from you. Some fun slideshows on our site that show great photos of the towns and sports at Lake Garda. There's also another slideshow featuring general photos of Lake Garda. A great selection of hotels and other accommodation around Lake Garda that are all available to book online. Info on some more sports, including paragliding, waterskiing and kite surfing. Info on the wonderful parks and zoos at Lake Garda. Thank you for reading our Newsletter, see you next month!